Taking full-timed practice tests is an essential ingredient to prepare for the ACT or SAT. What do you need to take a practice test? The College Board has released 4 practice tests for the new 2016 SAT. Click here to download each of the tests along with corresponding answer sheets, question explanations, and practice essays. Click here for a thorough scoring calculator. Click here for extra SAT Bubble Sheets. Click here for extra SAT Essay Paper. The College Board has also posted it’s official PSAT. Texas Instruments TI-84 Plus Graphics Calculator for your calculator permitted math section. Lots and lots of #2 pencils. An analogue watch that you can turn to the top of the hour each section in order to keep your own time (this is critical). Oh, and click here for my favorite SAT snacks! Below are of my favorite (and less well known) links to help you prepare for the SAT and ACT. Arts & Letters Daily — Articles to prepare you for the SAT reading section. New York Times Opinion Pages — Articles to prepare you for the SAT reading section. How to cultivate teenage drive is the $64,000 question, and while I am not a parenting expert, I do believe that the secret to motivating a teenager is the relationship. A shared experience can be a powerful agent of connection, and it is that connection that allows an adult to motivate an adolescent. Collecting Dance. Developmental psychologist Gordon Neufeld explains the “collecting ritual” in his book Hold On To Your Kids. The collecting dance is akin to making a baby smile before picking it up. The same holds true for a teenager: you must catch the eye and establish a connection in order to be a source of motivation. Enthusiasm. Most teenagers are more interested in their friends than in their parents and the SATs. In fact, the more into the friends they are, the harder it will be to get their attention. A peer-oriented teenager will need more enthusiasm and initiative from the parent to become motivated than one who is oriented toward adults. Given Ethan’s level of peer orientation at the time, I needed to deploy radical enthusiasm. Parental Involvement. Remain interested and involved, even if your teenager is resistant. I saw with my own eyes that adolescents do better academically when parents are involved beyond monitoring homework, and I believe Neufeld’s work with adolescents confirms my experience. Invite the Connection. The most potent source of motivation for a teenager is attention and interest in what they are doing. A shared project says that the child matters and is special. The relationship that results from this sustained proximity allows for the parent to act as a compass in the child’s life and to activate motivation. What is the Perfect Score Project? Find out more here. Below are a few clips from my keynote speech at the Kumon North American Instructor’s Conference. Tip #1: To motivate a teenager, stopped focusing on their behavior and started focusing on the relationship. Tip #2: Expect there to be bumps along the way. A kid who does bad things is not a bad kid. Get back on the horse and focus on building the relationship. Tip #3: The worst “punishment” my teenage son had ever heard of turned out to be the best “punishment” I inadvertently stumbled onto. Have You Reached Your Score Goal? This student was extremely motivated and methodical. We spent about 1 – 1.5 hours per week together, going over her tests. She did most of the heavy lifting on her own. 1 – Establish a Starting Point: She began the process with a lot of test anxiety, which makes her score gain all the more remarkable. She not only had the standard challenges everyone else has, but she also had to address the anxiety issue. Anxiety is terrible for an SAT score. 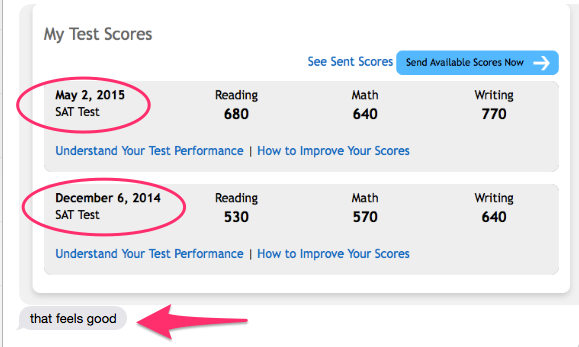 The goal for the December SAT was to survive! 2 – Study Aids: She took a brief hiatus after the December SAT, then started the Critical Reading Intensive by late December. In January, she studied math, using The New Math SAT Game Plan, and took a few sections out of the College Board’s Blue Book. 3 – Practice SATs: By early February, she was ready to start taking full, timed practice SATs. We made a schedule — one full SAT every weekend. 4 – Test Analysis: After she took each practice test, she’d spend 1 day looking up every single vocabulary word she didn’t know, including those from the reading passages. She studied those words every day, until test day. 5 – Charting Errors: After looking up the vocab, she would chart each of her errors, giving careful consideration to why she made the error, and coming up with new strategies for the next practice test. During the week, between practice tests, she’d spend about one hour per day, studying her errors. For example, if she made an “idiomatic expression” error on the writing section, she would spend an hour studying all idiomatic expressions. 6 – Different Methods: Each week, she tried out different “methods” of answering questions on her practice SATs. For example, one week she tried the passage based reading questions without reading the passage first (it didn’t work), another week she tried not guessing/leaving the question blank if she wasn’t sure of the answer (it worked), and another week she tried not leaving any questions blank. Different methods work for different people. One student scored an 800 on the reading section by not reading the passages before answering the questions. That didn’t work for this student. Some students are good guessers and some are not. Part of the test prep process is to rapidly figure out which strategy works best for which student. 7 – Practice Scores vs. Real Scores: Her practice scores fluctuated by about 50 points per section, from week to week. In the end, her May SAT math and reading scores were in the lower end of her range, and her writing score came in right in the middle.